Peeking inside a book bin at a Seattle Goodwill, Redditor vadermeer caught an interesting, unexpected glimpse into the early days of Apple: a cache of internal memos, progress reports, and legal pad scribbles from 1979 and 1980, just three years into the tech monolith’s company history. The documents at one point belonged to Jack MacDonald—then the manager of systems software for the Apple II and III (in these documents referred to by its code name SARA). The papers pertain to implementation of Software Security from Apple’s Friends and Enemies (SSAFE), an early anti-piracy measure. Not much about MacDonald exists online, and the presence of his files in a thrift store suggests he may have passed away, though many of the people included in these documents have gone on to long and lucrative careers. The project manager on SSAFE for example, Randy Wigginton, was Apple’s sixth employee and has since worked for eBay, Paypal, and (somewhat tumultuously) Google. Apple co-founder Steve Wozniak also features heavily in the implementation of these security measures. Buried amid workaday engineering goals and obsolete technical jargon are a few amusing nuggets from these 116 pages which vadermeer was kind enough to upload for all to read. In describing levels of security, Wigginton defined the only means of attaining 100 percent certainty that software couldn’t be breached as “disallowing any access of any kind to the software and the computer,” which he calls “not very practical in our circumstances.” Call it an engineer’s sense of humor. Taylor Pohlman—who would go on to become Product Marketing Manager at Apple a year later—touched on an issue that’s still pervasive in the present day: non-tech business partners having no clue what they actually want, and lacking the technical knowledge to ask for it correctly. Multiple different protection methods and implementations are tried out by the team over the course of these SSAFE documents. And much of the inter-office communication gets mired in the dull details of cost effectiveness and software architecture. “Scrubbing bubbles” as a name for a protection scheme stands out purely for its weirdness. I broke Visicalc’s scheme. Elapsed time=1hr 15 mins. I would rate it slightly better than the scrubbing bubbles & microchess schemes, but not as good as our scheme (either for vendors or internal programs). Despite the memorable name, it seems “scrubbing bubbles” didn’t make the cut. Unfortunately, some consumer software still uses physical security (looking at you iLok) despite being described as “a case of the cure being worse than the disease” almost 40 years ago. It seems at some point SSAFE was a runoff between competing schemes developed by Woz and Wigginton. Among the considerations were existing contracts with software developers—in the case of this particular memo, Personal Software, which started selling Visicalc, the very first spreadsheet software. Apparently, neither security scheme “adheres to the letter of the contract” Apple had with Personal Software. It’s unclear how or if this was ever resolved. And finally: a prescient subject line if ever there was one. 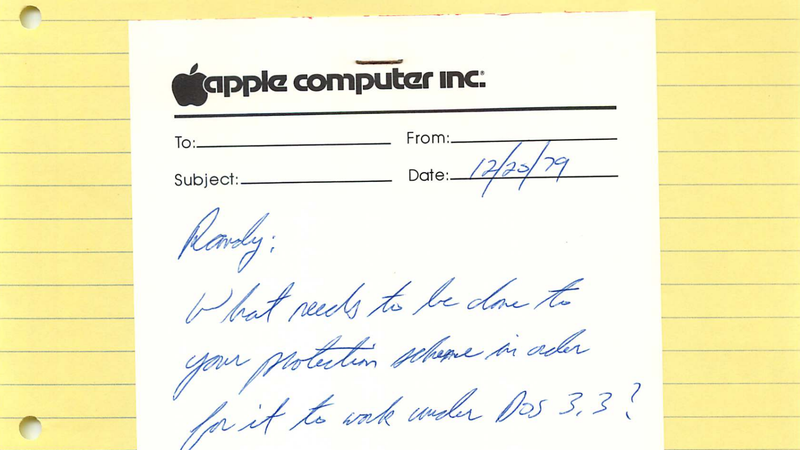 We reached out to Steve Wozniak for more details on these documents, which you can read the complete text of here.